You may still remember my previous post about Spam Fighter which helps you fight against spam emails, here is another most efficient, FREE product from Agnitum - Spam Terrier that also effectively protects you from unnecessary emails and malicious contents. If you are an active e-mail user, you should have encountered the problem of unsolicited mass e-mail distribution, known as spam. Even though server-side (run by your Internet Service Provider) anti-spam solutions significantly reduce spam, users have no control over it. The worse thing about it is that your important messages lose because of incorrectly labeled as spam. The computer security experts at Agnitum unleashed Spam Terrier 2.0 for users of Microsoft Outlook, Outlook Express, Windows Mail (in Vista) and The Bat which provides self-learning protection against unwanted emails (known as spam). 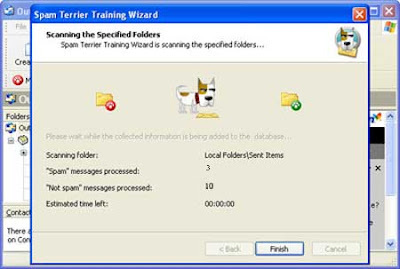 Based on the Bayesian spam filtering method - the most effective method of automatic statistical spam filtering, Spam Terrier keeps unwanted messages out of your in box. Every mail that arrives on your mailbox will be automatically tested and quarantined.